Last week we shared best practices for delivering bad news, but sound public relations techniques are also effective for amplifying good tidings. In fact, happy news is a main driver for social media sharing. Emotions layered with happiness make up the majority of top drivers of viral content. Crenshaw client Brainjolt knows this; it delivers feel-good content that engages 100mm people each month. We admire brands that leverage good opportunities into great ones. Let’s see how some companies enhanced and amplified recent positive news. The ultimate feel-good story: a baby was born mid-flight on Spirit Airlines. No complications and a smooth delivery, thanks to the crew and a pediatrician and nurse who happened to be onboard. 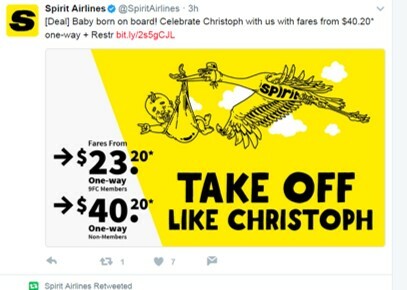 Best of all was the airline’s quick PR thinking as it announced that young Christoph Lezcano will fly free every year on his birthday for life. The positive news coverage that resulted has been PR gold for Spirit. And it’s good timing; the airline industry has suffered its share of negative news all year. Spirit itself was the subject of a disgruntled passenger story just days ago. Now, as the summer vacation season lifts off, the Spirit brand is flying high and going one step further to let customers in on the celebration with a smart, baby-inspired price promotion. Shhh. Make news by not saying a word. Sometimes a competitor’s misfortune is all a company needs to see its own fortunes rise. That was the case this past week for Lyft, ride-share rival to Uber. While Uber has struggled with reputation setbacks, culminating in the resignation of its CEO last week, Lyft has quietly kept to itself, plotting a successful path as the “friendly, laid-back alternative to Uber’s cutthroat corporate ethos.” And, without doing anything differently, the company is now enjoying a nice moment in the PR sun and giving its app engagement a “lift” as well. Lyft co-founder and president Jon Zimmer has refused to chide Travis Kalanick or outwardly engage in schadenfreude, staying true to his brand’s personality. And disproving the adage that nice guys always finish last, Lyft’s feel-good alternative has proven one of the tech world’s great success stories, as Uber has been bogged down by one misstep after another. Stephen Hawking once told the BBC that “the development of full artificial intelligence could spell the end of the human race.” And most of us have come to link robots with bad news — how many jobs they could take as they replace humans. How refreshing it is then, to see a robot story that doesn’t spell gloom and doom for the planet. Zume’s Robot Pizzeria has given its automation story an extra slice of positive news for the human race. Zume’s tasks only the most mundane or dangerous duties to its machine, which is aptly named Doughbot and is now deployed on its “robot-enabled pizza assembly line.” Doughbot presses dough up to five times faster than a person and can’t be burned – at least not by the heat of Zume’s 600-degree ovens. This efficient automation allows for the tech-driven pizza delivery company’s human employees to focus on menu-planning, marketing and other company business. Zume founders are successfully integrating a human/robot workforce and have packaged the story and positioned the company very positively. Today, the San Francisco-based firm employs 115 full-time staff, all of whom receive benefits like health insurance and free pizza. The bottom line is – your company doesn’t have to wait for something serendipitous to occur to spread good cheer. In all workplaces, there are positive stories to share. We all act as reporters looking for effective client and agency stories with some emotional impact. We can then decide to simply share through social media or, when warranted, to make a bigger media splash. We recommend creating a storybank of your own. Remember to look for stories that have strong personal emotion, a conflict or obstacle to overcome. The exercise will help you become a better storyteller yourself and prepare you the next time you have some good news to share.